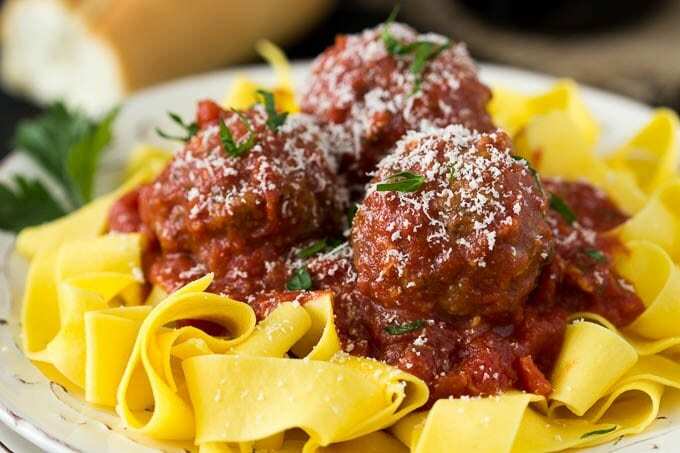 Does it get any better than Mozzarella-Stuffed Slow Cooker Meatballs? 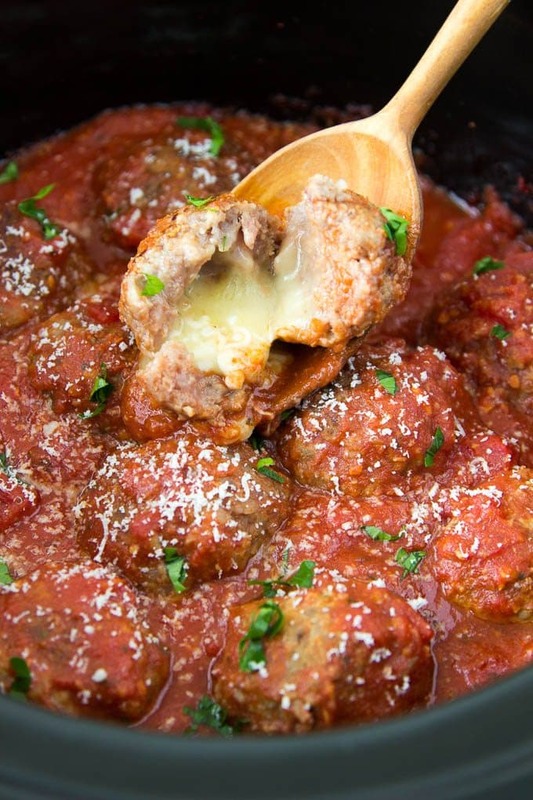 These Italian inspired meatballs have an ooey gooey cheesy surprise inside! (yes! there is cheese stuffed inside the meatball!) Let the crockpot do the work for you. 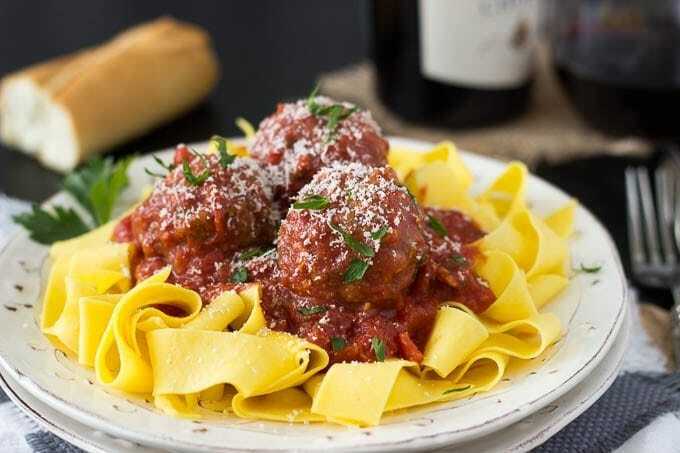 Come home to the aroma of a home cooked Italian meal, and the cheers of your family as they twirl pasta on their forks and bite into these tasty meatballs. We are right smack dab in the middle of December (how did that happen?) , which means smack dab in the middle of all the holiday rush. Holiday shopping, parties, blah blah….it’s busy! Which is precisely why today’s “One Pot Wednesday” Crockpot Meatballs are going to be your new best friend! I’m feeling a little nostalgic for my best friends and for Italy today. Had a chance to chat with a few of my besties…I always love when we can catch up. We used to all live in the San Francisco area but these days we are spread all across the globe. This time of year is pretty magical and we’ve managed to somehow pull off multiple Christmas/New Years’ trips together all over Italy. Nothing better than a snow-covered Italian village, a quaint agriturismo , a huge stone fireplace, a lot of good wine, laughter and the aroma of a home cooked Italian meal. Which is exactly what my house smelled like today! I was teleported back to Italy and all those special moments. You don’t need to travel all the way to Italy (although I highly recommend it!) to experience the warmth of an Italian meal. Just plug-in your crockpot/slow cooker and let it do all the work for you! These may look like “normal” meatballs, but they have a little cheesy mozarella surprise waiting inside. Super easy to make and not much hands on time. I used small cubes of mozzarella cheese ( you could even cut up a cheese stick if you want) and stuffed them in the middle of the meatballs. More details and pictures listed in the recipe below. So flavorful! 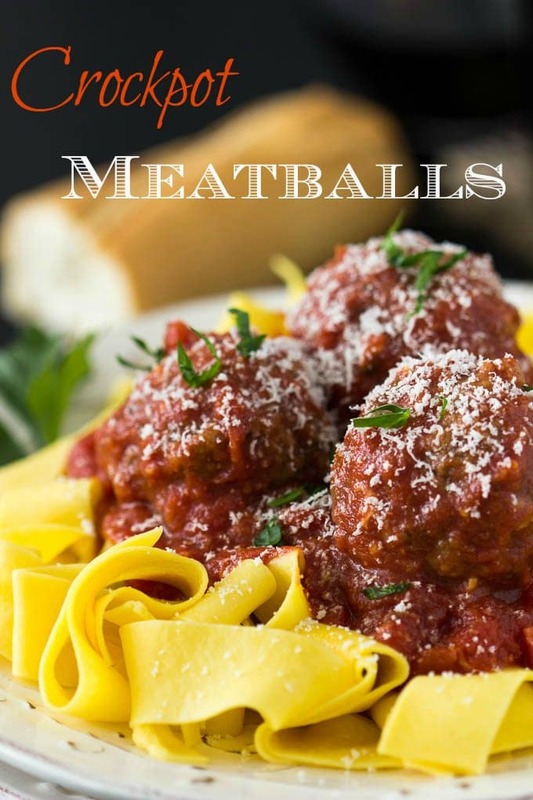 I used a combination of ground beef and sweet Italian sausage which gives the meatballs such an amazing juicy taste. All the flavors mingle as they cook in the crockpot creating incredible Italian flavors. If you simply must have meatballs “right now”, no worries you can cook everything in a pot on the stove top in about 30 min. Perfect on top of your favorite pasta or tuck them into a sandwich. Freezer friendly , you could always stash some away for another easy meal. In a large bowl combine ground beef, sausage, egg, bread crumbs and worcesteshire sauce. Use hands to thoroughly combine. Form into golf ball size meatballs. (approx. 12-15). 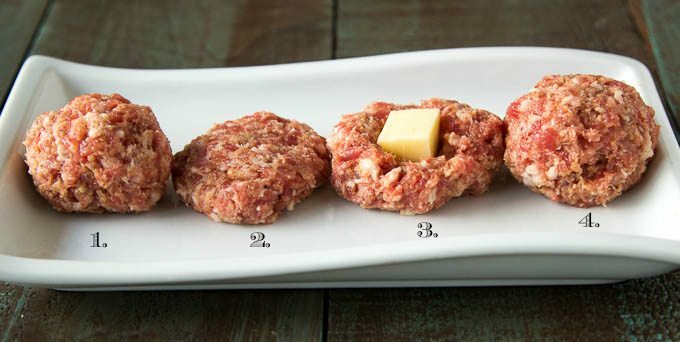 To stuff meatballs flatten the meatball, place a cube of cheese in the middle of the flattened patty and fold edges around cube and reform into a round ball by rolling in your hands. Set meatballs aside. Combine tomatoes (crushed, diced and paste) onion, garlic, parsley, basil, red pepper flakes and bay leaf in a 5 or 6 qt. slow cooker. Mix thoroughly. In a large skillet over medium heat add a small amount of olive oil (or water) and cook meatballs just until all sides are browned (approx. 2-3 min.) 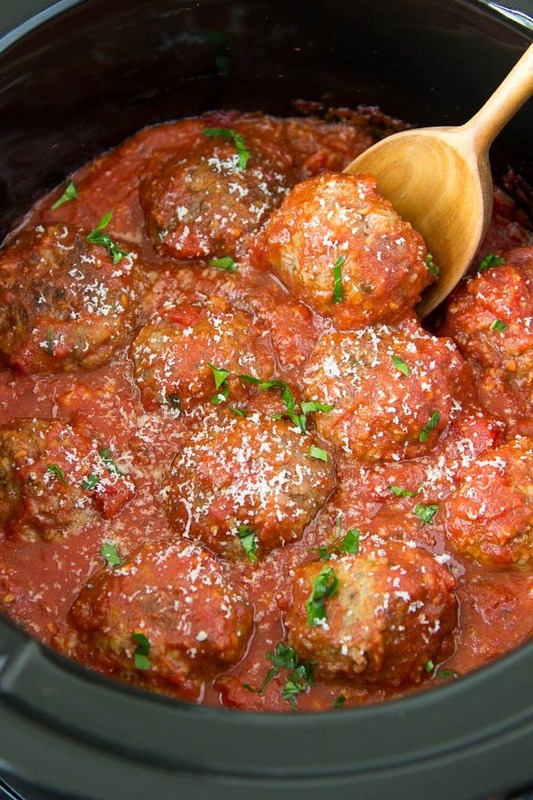 Add meatballs to the sauce in slow cooker, spoon some sauce to cover meatballs. Cover and let cook for 3-4 hours on high or 5-6 hrs. on low . Remove bay leaf before serving. Cook pasta according to package instructions. Drain and rinse. Top with meatballs and sauce. Add fresh chopped parsley and grated Parmesan if desired. These are really good. Love the cheese in the center of the meatball. Will definitely make these again. These look SO good, and the crock pot makes it so easy. Can t wait to try them.